The story line of Diablo III is mostly unknown to us at this point. We know it takes place twenty years after a few powerful heroes saved Sanctuary from the demonic onslaught in Diablo II. Note that during the pre-game period, the information on this page is a mixture of canon and speculation based on the few clues reveled by the D3 Team. This article will be entirely reworked once factual details about the story of Diablo III become available, with the game's launch. 5 The End of Diablo Story? The developers have often spoken of the goals and tactics they'll use to incorporate story into Diablo III. They're aware that while some players read every NPC dialogue and really get into the lore and plot, a lot of players simply click through every dialogue in their rush to kill more monsters. The developers therefore try to incorporate an interesting story, and allow the key points to be absorbed very quickly, while providing more depth and detail for players who want that. This is accomplished in a variety of ways, one of the most obvious is the ability for dialogues, lore books, NPC speeches, and other longer block of narration to play on while the player continues battling. You do not need to stand still and listen, as you did in Diablo I and Diablo II. The book texts and NPC dialogues an also be accessed later via the Lore Window; you do not need to return to a given NPC or book in order to reread the text. I know a lot of people who just clicked their way straight through the entire thing and never really paid much attention except to get their shiny loot. How does that impact you as a creator? LB: Well the way we have to approach it, we think of it as a story told in layers. For the player who is just going to click through everything, we need to deliver a compelling story that is very quick to grasp and has the basic elements you need for getting to your next quest objective and understanding what's going on, but we also want to keep a little bit of the emotional impact in there - we want to make sure that it feels like you're doing something as opposed to just running around and clicking on things - we want to make it feel like there's some sort of context. So our goal with that kind of player is to make it so that even if they're just skimming everything that we are delivering a very basic part of the story to them. Then for the players who dig deeper and for instance go into the back-stories of the followers, they'll get a much deeper understanding of the intricacies of the world and what's going on and how it all fits together. We try to serve both types of players. Though the developers have shared few details about the game's plot, the basics are known. The demonic invasion 20 years ago (events depicted in Diablo II and its expansion) affected very few people, most of whom are now dead or insane. As such hardly anyone living knows what actually happened with Mephisto, Diablo, Baal and the destruction of the Worldstone. The few people who do know the details, such as Deckard Cain, are disbelieved and marginalized. While most humans are aware of magic and demons in a general sense, the bulk of humanity on Sanctuary has no idea of how perilous their existence is, with the forces of Hell (apparently) poised to invade the mortal realm. Twenty years ago, Tyrael did destroy the Worldstone, but he has not been seen since. Scholars who knew of the crucial events expected demons to begin pouring into the mortal world after that, since the Worldstone which kept them largely at bay was destroyed. This has not happened, and no one in Sanctuary knows why not. Jay Wilson hinted that this is part of a ruse by the Burning Hells, to let humanity *think* they've defeated evil and no longer need keep their guard up. It is known that Belial will appear in the game, as will Diablo. Where and how those two demons will be faced is not known. Diablo's return aside, the primary villains of Diablo III have been confirmed to be "two major demons and the impending invasion of Sanctuary" rather than the homelands of individual character classes. It's also known that Belial will figure in the game, which makes Azmodan a logical choice for the other demonic lord, since those are the only two of the seven Prime Evils or Lesser Evils who have not yet appeared in the games. "Several of the NPCs, from both the original Diablo and Diablo 2" will also return according to Jay Wilson. Much of the plot is set up to twist and trick players, including the entire world premise, as Jay Wilson alluded to in an April 2011 interview. If the player thinks they outsmarted the forces of Hell and evil and they basically won, well, they are in for a big shock. Because what they are going to discover in Diablo3 is that things have gone pretty exactly the way Hell wanted them to go all along. 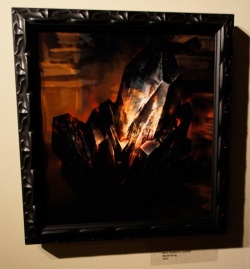 Another element was added to the story with the sighting of a painting of a "Black Soulstone" in April 2011. The painting hangs in the Diablo III section of the Blizzard Irvine art gallery, and is a recent work (2010 by Bernie Kang. How it fits into the game's plot is unknown. Blizzard has offered no comment on the object/painting. Not even one of Bashiok's usual cutely-cryptic remarks. Fan speculation has run rampant and there is no consensus, but many fans feel the Black Soulstone is a shard of the Worldstone, which Tyrael shattered after Baal's death. Why it's black, where it's located, and what it's been doing for the past twenty years is entirely unknown. One theory holds that Tyrael was imprisoned in a shard of the Worldstone, perhaps this black one, and that's why he has not been seen since. There's no known lore to support Angels being trapped in soulstones (as Diablo, Mephisto, and Baal were), but it a soulstone can contain the essence of a demon while its trespassing on the mortal realm, why not an Archangel? A quick summary of what's known, with some educated speculation added to flesh things out. Events in Diablo III kick off with the fiery comet, shown in the Cinematic Introduction, that comes crashing down through the roof of the Tristram Cathedral. This event is witnessed by Leah and possibly Deckard Cain as well, and soon after this event the demons and undead within the catacombs below the Cathedral are awakened. The first Act of Diablo III will consist primarily of characters battling monsters below the Cathedral, including the Skeleton King. Act Two ttakes place largely in and around Caldeum, a city in the Borderlands, far distant from the Tristram region. Events include fighting across the desert to the city of Alcarnus, which has been overrun and destroyed. Act Three takes place largely in the Barbarian lands of the far north, including the Arreat Crater. The demon invasion truly begins at this point, with players tasked with aiding the human defenders in repelling a demonic siege of Bastion's Keep. The setting and events of the final act remain a complete mystery. The only clues so far released came from the developers stating that the overall game structure of Diablo III will largely follow that of Diablo II, with the final act more of a finale than another full-sized act. Thus a return to Hell, taking the battle directly to the home of the invaders, is not out of the question. From what the Diablo 3 team has said about the state of the world at the start of the game, and from additional information included in the D3 cinematic teaser, this is the apparent state of the world. This summary incorporates some speculation. After the conclusion of events in D2X, including the slaying of Baal, his vast armies remained a threat to the Barbarian lands even after Baal's death. Their threat was ended by the explosion of the Worldstone, which destroyed Mount Arreat, blasting Arreat Crater, an explosion that devastated the remainder of Baal's forces and ended their siege of a major Barbarian city. And while "Diablo III" ends the trilogy, fans needn't worry -- it's not the final curtain for "Diablo." "We're not saying this is the end of the 'Diablo' universe, but we are trying to bring this storyline to a close," Wilson said. "It's not just 'Diablo III' -- we've got plans beyond." Closing this storyline would presumably mean that Diablo IV would be set in a very different time, in the land of Sanctuary. It could be long before the current series, or far in the future. The team would be unlikely to change the overall dark and gothic feel or tone of the game, since that's what makes Diablo unique. But they'd probably like to have different plot points than than the 3 Prime Evils roaming around, Tyrael showing up to help humans, etc. Nothing is yet known about how Diablo 3's story will unfold or end, so it will be interesting to see how the team wraps up this story. After all, while Diablo 1 clearly ended with evil, at best, scarcely contained, Diablo 2 seemed a more final conclusion. The three brothers were defeated and their soulstones smashed. Only the destruction of the Worldstone provided a cliff hanger of sorts. Diablo III's plot, which will presumably continue through at least 2 expansion packs, will provide a more definite ending, tying up all the ongoing loose ends. In the game, are there any choices for players to make that will affect the later part of the game? Like a split story lines in Starcraft 2, but with a fixed ending. Jay Wilson: No, because of the dynamic nature of the game and the fact that the game is cooperative. Those things really fight against a multiple story line. Because if you got other people who are in the same game, what if they made a different choice than you, and can not see their options? So we’ve tried to keep everyone on the same track, mostly to support cooperative, since that’s one of our primary focuses, so we wanted to make sure not to include any feature in the game that can't play cooperatively in some way. Great Conflict - The battle between Demonkind and Angelkind. Sin War - The above battles when they take place on Sanctuary (or presumably any mortal realm). Dark Exile - The banishment of the Prime Evils from Hell. Great Evils - The biggest badasses of the Burning Hells. Prime Evils - The biggest Great Evils (Mephisto, Baal and Diablo). Lesser Evils - The non-Prime evils of the Great Evils. Burning Hells - Home of all Demons. Nephalem - The first humans, the children of the demon Lilith and the angel Illidian. The joint-heritage of the Nephalem gave them the potential to become stronger than either angels or demons, but the Worldstone blocked and retarded that potential. Now that 20 years have passed since the Worldstone was shattered, it is possible that some humans are regaining their former might. Certain pieces of equipment, jewelery, weapons or other items contain so much power they are called artifacts. The world of Diablo is full of them, and if you're lucky you can find some powerful artefacts in your travels around Sanctuary. This page was last edited on 5 May 2012, at 14:12.